Car backseat organizers either buckle or velcro around a headrest, providing backseat passengers convenient access to reading materials, tablets, bottled water, and other miscellaneous travel accessories (Source). Plus they protect your backseats from kicking and scuffing. They feature a variety of compartments and pockets, helping to store a variety of differently-sized items (Source). They're frequently purchased to help entertain children in the backseat, allowing kids to 'self-service' during long car rides- accessing their toys, sippy cups, and other resources (Source). Parents with more than one young child often purchase a pair of these car seat organizers to reduce 'sharing' issues between brothers and sisters. Each sibling gets their own organizer with their own toys- helping decrease stressful fights during long drives (Source). As well, Uber and Lyft drivers find them a convenient way to serve their paying passengers with breath mints, napkins and bottled water (Source). The Mom's Besty Luxury Car Back Seat Organizer features a tablet holder- though there have been complaints about fit of devices that are over 10" long. The Autoark features a zippered cooler pocket- a space to store hot or cold beverages. The Fancy Mobility produces the best-rated option, in the opinion of the users we interviewed. Plus it comes with a visor organizer- great for storing documents and loose cash. Buyers we spoke with told us that they were impressed by the design and quality of this back seat car organizer. The top storage pocket is pretty spacious and all of its assorted compartments can accommodate a ton of different items. Installation is easy and you can adjust it to get a convenient height for your specific car model. Additionally, it ships with a visor organizer- useful to store travel documents and other personal effects. This car seat organizer offered by Autoark is a solid option for someone who needs a standard multi-pocket car seat organizer. Users love the usefulness of this space-saver, but some do complain about cheap quality. This product features a large storage space, with an included tissues dispenser at the bottom of the bag which helps keep clean tissues close at hand. It comes with enough pockets and compartments to help you stash everything you need to make it through any road trip in comfort. This car seat organizer seems like a solid choice if you are looking for a product with an insulated main compartment. The general user consensus concerning the Autoark car seat organizer is that it is very useful and a great space-saver. One happy purchaser states that thanks to a stretch cord you fasten it at the bottom and keep it close to a seat back. Another satisfied user suggests getting this product if you are an Uber driver like himself because the passengers love it. However, some buyers complain about the cheap quality and inaccurately posted measurements. The complaints regard fairly short side net drink holders, a poor quality zipper that tore away within several days and the cooler bag component which is not sealed well. This car seat organizer offered by M’Baby is a solid option for a mom-on-the-go. 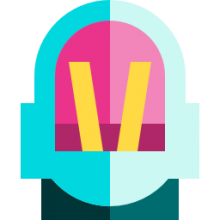 Users like the handiness of the product, but do complain about super cheap quality. This product features 2 small pockets for small things (such as phone, purse etc. ), 1 bigger pocket for documents, toys, blankets and the like, 2 bottle pockets and 1 tissue box pocket. This car seat organizer might be a solid choice if you are looking for a place to keep your essentials in the car neatly organized. In general, users have a favorable opinion of the M’Baby car seat organizer, saying that it is a handy item for Uber drivers or moms and that it meets the basic needs for organizing your stuff in a car. However, many buyers complain about the quality of the product saying that it is super cheap. They share that it is not thick, which causes it to sag forward once you put something in it. One buyer comments that it is not suitable for holding anything thick like a book or DVDs. If you are looking for a top-rated car seat organizer, you might want to consider this kids toys storage offered by Fancy Mobility. Users love the usefulness of this car seat organizer, but some do complain about the bad fit and poor quality material. This product is a hand-crafted car seat organizer with faultless sewing and made of indestructible materials that are waterproof, easy to clean and completely odorless. It features deep pockets and strong elastic linings, which is great because it holds perfectly all of your children’s storage needs securely in place. If you are looking for a baby shower gift for new moms, this might be a good option. In general, users have a favorable opinion of this car seat organizer and they state that it is useful and holds enough stuff without straining the mesh pockets. They state that it is very simple to install. However, some purchasers complain that the product doesn’t fit their car seat. Moreover, some do complain about the cheap floppy material. One dissatisfied purchaser says that it doesn’t hold as much as it is depicted in the advertisement. This car seat organizer offered by Mom’s Besty is a good option for those who need a luxury back car seat organizer. Users like the usefulness of this mom’s organizer, but do complain about the size of the tablet pocket which doesn’t fit tablets as advertised. This product features a tablet pocket with a clear touch-screen viewer window, which can fit Android and iOS Tablets up to 10.1”. 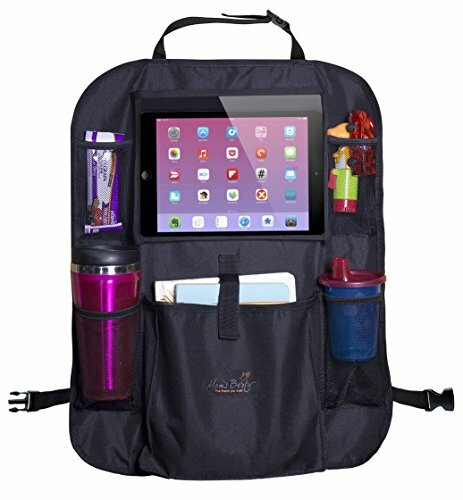 It also features 4 additional mesh pockets with elastic tops and a polyester pocket for bulkier items with a Velcro strap to hold things in place. 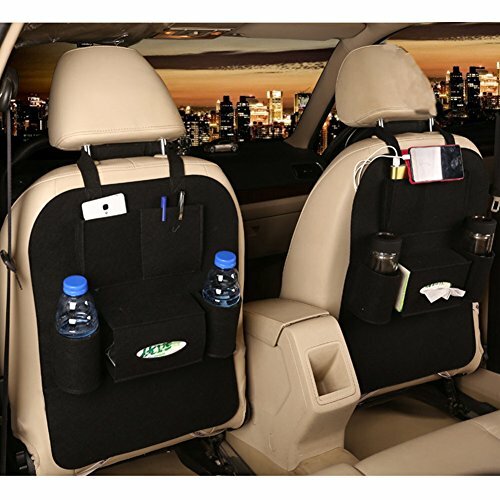 This back car seat organizer could be a good choice if you want a luxury one with a tablet holder. In general, buyers say that this is a good backseat protector with nice storage space options. They add that it is easy to install and that material seems very sturdy and durable. However, several buyers complain about the tablet holder which doesn’t fit a 10′ tablet of any brand (without a case or cover) in landscape position. 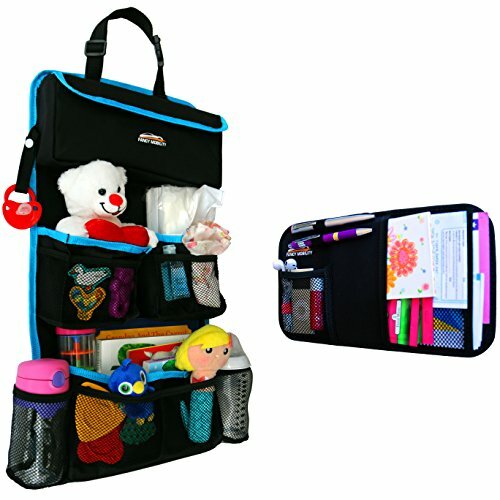 If you are looking for a car seat organizer, you might want to consider this kids toy storage offered by EPAuto. Users like that the handiness of the product, but do complain about the quality of the material. This product can be used as a baby backseat organizer for diapers, wipes, bottles, toys, tablets, books and it also acts as a kick mat and protector to the seat back. 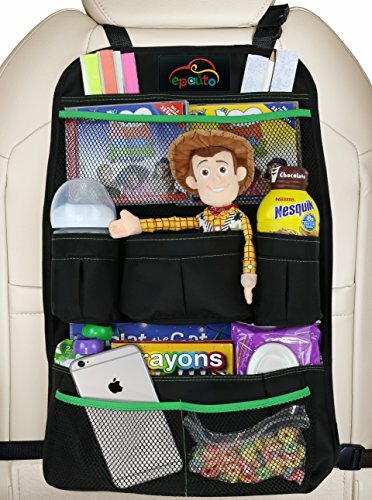 It is durable and easy to clean, with a universal design that can attach to the seat and headrest of most vehicles.If you are looking fora car seat organizer for baby travel accessories, this might be a solid option. In general, users have a favorable opinion of this EPAuto car seat organizer, saying that it is convenient and handy. They state that the product has a lot of compartments for holding various things and it doesn’t cover a lot of space on the backseat. However, some buyers complain about the product’s quality. One online commenter shares that one side wore out completely not long after the purchase. Another one shares that it fell apart soon, even without inserting any heavy items. The first car seat back organizer we examined is manufactured by Autoark. It comes in a standard size that measures 11.8" x 10.2" x 5.5" and a big size that measures 4.6" x 10.2" x 5.5". They emphasize its extra large storage capacity that is ideal for holding tissue boxes, children's drinks, magazines, newspapers bottles of water, anything really. It's built from polyester material, making it easy for passengers in your back seat to store and access comfort food while traveling, or keeping the iPad handy for your child in the backseat during long drives. The way it works, you attach it to the headrest support on either the passenger or driver side car seat by buckling its adjustable strap- and you're ready to go. In addition, it includes zippered compartments to help insulate cold and hot foods and drinks. One buyer criticized the side compartment drink holders, saying that they aren't ideal for holding tall drinks- they have a tendency to fall out whenever the car makes sudden turns. As well, the cooler isn't really that great- with some buyers complaining that the stitching prevented it from truly sealing cold or hot air inside of the bag. Uber and Lyft drivers often use these car seat bag organizers, saying it's a great place to store cheap and free items like gum, breath mints and bottles of water for their paying passengers. The second car seat back organizer is manufactured by M'Baby. It's made from felt, helping to protect seat backs from kicking children, while at the same time providing a handy storage area for drinks, tablets, iPhones and pens. It's marketed as a handy space saver for your car or truck's interior, converting the unused space on the back of the passenger and driver side seats into organizer areas that can accommodate a range of different food and play items for long car trips. One common problem this fixes is when children in the backseat unleash a water bottle that can potentially roll up to the driver side area, impairing the driver's ability to operate the vehicle. It ships with one large pocket that is document-sized, two pockets for bottles and one pocket that can hold a tissue box. Because it straps up with Velcro, as opposed to buckling with a latch, some buyers thought that it wasn't as secure as it could be. Indeed, many buyers complain that the material was cheap and gave the feel of a low-quality product. The third backseat car organizer we examined is manufactured by Fancy Mobility- it actually ships with a car visor organizer, as well- a handy storage area for traveling documents and other paperwork to keep things immediately at your fingertips. It's marketed towards harried mothers running daytime errands with very young impatient children, all the way to traveling salesman who frequently cart around coworkers on long jaunts to foreign work facilities. Buyers were impressed at how inexpensive it is, while also commending the very well thought out design that enables it to store a lot of materials without over straining the mesh pockets. Buyers say it has been a lifesaver for hauling children around on road trips, enabling their kids to access the pockets to store their favorite toys or just swap sunglasses. Indeed, for especially young children, this organizer is a great way to keep the essentials on hand, whether that be diapers, wipes or snacks. For adults, they provide space for a coffee thermos and an area to easily tuck a novel should you need some downtime reading material. The fourth car backseat organizer is manufactured by Mom's Best and features a tablet holder with a viewer window. It's equipped to fit tablets that measure up to 10.1", helping to provide shared entertainment for a backseat passengers in a hands off and hands-free fashion. It's built from durable polyester designed to resist shrinkage or stretching with a waterproof backing that helps protect car seat upholstery from abrasion and getting scuffed from kicks. It's marketed towards parents getting up early in the morning to transport the children to school or for extended road trips. It attaches to adjustable headrests with buckling straps that usually embrace most car seat styles. Buyers were impressed with the number of pockets and its ability to adequately serve backseat passengers a variety of handy driving resources. On the other hand, one reviewer told us that they have had trouble fitting a 10-inch tablet into the tablet viewfinder, saying they had to stack it vertically which obviously ruined the effect because the screen was bisected by the mesh pocket. One driver says that he installed it in the back of his own driver seat so that he could reach around to access a map, pulling in from the center pocket. Another reviewer told us that it's great for handling a bunch of miscellaneous and differently sized items for long car trips, but as one driver noted it wasn't an ideal way to store and play movies on a tablet for a road trip. This is because the plastic that is the face of the viewfinder was wrinkled which ended up distorting the view of the iPad they were trying to have their children watch cartoons on. The last car backseat organizer is provided by EPauto. It's marketed as a convenient way of storing a baby travel accessories while providing a kick mat to prevent the backs of your front seats from getting kicked and scuffed by angry children. One reviewer opted to store small bottles of Windex and other cleaning solutions in it for their mobile home cleaning operation. Another reviewer who hauls his family around on biannual summer road trips says it is a slim and non-bulky option that helps provide backseat passengers with spacious leg room as opposed to larger bulkier backseat car organizers. As well, it's a great way to deal with sharing issues between children- since both car backseats have organizers, each child is divided up his own toys and resources, decreasing the incidence of loud and unruly arguments during stressful family outings. Fitted with a variety of different compartments, some buyers say you shouldn't keep valuable items in it like a Kindle or tablet, for instance, in the event that it might fall out and potentially break.